Why are some union leaders saying public sector workers shouldn’t have the right to strike? But union leaders? You’d think they would recognize the danger of the moment we’re in, after the Supreme Court just dealt a devastating blow to public sector unions in Janus v. AFSCME. You’d think they would see the potential of this moment, too, after an exhilarating wave of teacher strikes (and with even a popular summer movie about call center workers on strike, “Sorry to Bother You”). You’d think they would be trying to get working people fired up to take back our power from the bosses. Instead, we get spineless leaders cozying up to elected officials. Nixon is the gubernatorial candidate who recently came out in favor of eliminating New York’s Taylor Law, which bans public sector strikes. Passed in 1967 after a wave of strikes by transit workers, teachers, and sanitation workers, the law imposes fines on strikers—two days’ pay for every day out. Union leaders can be sent to jail. The law was last used against New York City subway workers after a three-day strike in 2005. Transit Workers Local 100 was fined $2.5 million and lost automatic dues deduction. The president was jailed for four days. “The Taylor Law has worked effectively for more than 40 years,” New York State United Teachers spokesperson Carol Korn told the Times Union. “In conjunction with the Triborough Amendment, it has ensured labor peace and we are not seeking a change at this time.” The Triborough Amendment stops public employers from changing terms and conditions after a contract expires; no one has called for its repeal. What’s the deal? These union leaders are jostling to show their support for incumbent Governor Andrew Cuomo in the primary. But they’re also showing their true colors. 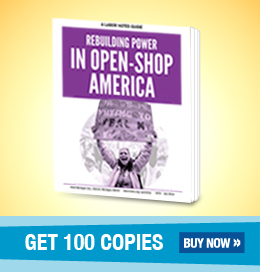 Many are still clinging to a tired strategy where they try to win improvements by exchanging political favors, instead of by educating and mobilizing workers for collective action. Especially for unions scrambling to sign up members post-Janus, this approach is a dead end. The right to withhold our labor is the most powerful tool workers possess. Non-members see that, too. Before my co-workers and I formed a union at Verizon Wireless, I had already witnessed union power firsthand. In 2011 I saw our Verizon landline counterparts strike, disrupt business as usual—and win real improvements. When my co-workers and I took the very scary step of organizing to join the Communications Workers, we understood that the union’s willingness to strike might just be the leverage we needed to secure a first contract. We believed in that strategy. I’m not sure we would have been so willing to put our livelihoods on the line if we had heard about members working years without a contract and negotiating givebacks—as is unfortunately the case for many New York public sector unions. It’s time for union leaders to start fighting instead of deal-making. Or at the very least, they could just get out of the way so we can all get free.